By far some of the nicest Reissue guitars ever created came out of the Fullerton factory in the early 80's. We have had our hands on hundreds of old Fullerton era guitars and are extremely excited to offer a full line of red bobbin pickups!! 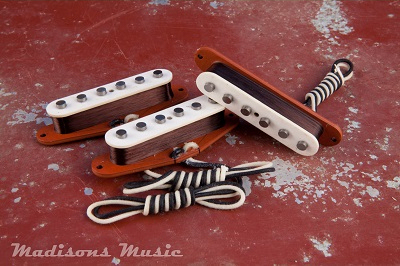 Our Fullerton Strat set is wound with a plain enamel 42 wire and has Alnico 5 magnets. The set offers a bubbly crisp tone. These are wound much like a late 50's set. The pickups offer a clear defined midrange with little compression. Clarity and individuality in notes is very evident without being bright or tinty!